Today’s business environment is highly competitive, and if your organization is going to thrive, your team members have to perform faster and better than ever before. If you’re a leader or manager, you’ll need to invest the time and energy to coach your team members toward success. But what if you haven’t coached before? What if you need to grow your coaching skills so you can provide your team members with the support they need? That’s where The Coaching Clinic™ comes in. What is The Coaching Clinic™? What is The Coaching Clinic™ Model? What does The Coaching Clinic™ Accomplish? Who Benefits from The Coaching Clinic™? How is The Coaching Clinic™ Implemented? The Coaching Clinic™ is an interactive session that helps managers build a culture of coaching to help employees reach their full potential. The goal of The Coaching Clinic™ is to help leaders learn how to coach team members toward success in today’s highly competitive business environment. The Coaching Clinic™ is typically conducted as a two-day in-person event but is highly customizable and adaptable. It is geared toward managers who want to gain highly impactful coaching skills to build relationships, lead others, develop and retain team members, and strengthen accountability. In the rapidly changing business environment of today, coaching is the master skill that wraps around all other leadership and management skills to adapt and respond to the needs of an evolving workplace. The Coaching Clinic™ Workshop sessions consist of content focused on core, advanced, and real-life coaching skills; hands-on practice implementing coaching techniques with real work scenarios; and the Personal Coaching Styles Inventory™ self-assessment to determine interpersonal interaction styles in the context of coaching. The workshop is built around the Coaching Conversation Model™, which helps leaders develop coaching capabilities in five key steps throughout interactive sessions. The Personal Coaching Styles Inventory™ is an assessment based on the work of Dr. Lee Smith and Dr. Jeannine Sandstrom of CoachWorks International. The assessment has been used since 1995 by tens of thousands of individuals to self-assess their interaction styles from the coaching context. It is a self-inventory that allows people to designate how they want to give and receive feedback and advice, as well as shows a snapshot of how individuals can have effective communication in relationships. The styles in the PCSI™ show participants both how they want to be coached and how they can be more effective as a coach. It consists of four styles, each with its own strengths and liabilities: directing, presenting, mediating, and strategizing. The Directing style describes coaches who like to be in control, focus on results, and think about the possibilities. They are willing to take on new challenges or risks, set goals, and work hard to achieve them. The Presenting style describes coaches who are animated, energetic, and spontaneous. As coaches, they are excellent communicators, can be very persuasive, and are comfortable as the center of attention. The Mediating style describes coaches who are personable, experts in their field, and helpful. A mediator coach is patient, thorough, and likes to make everyone in a group comfortable. The Strategizing style describes coaches who are thorough, painstaking, and hardworking. They are careful to think things through, experts at analyzing and solving problems, and careful and diplomatic communicators. Participants in The Coaching Clinic™ gain an in-depth understanding of the coaching process, develop crucial coaching skills and competencies, and practice using those skills using real work situations while in the clinic. They will master the Coaching Conversation Model™ through practice and gain a deeper understanding of their own preferences and styles with the Personal Coaching Styles Inventory™ including how to flex their style to others' needs and preferences. The Coaching Clinic™ can benefit executives, managers, supervisors, human resources professionals, and leaders at any level who want to learn advanced communication and leadership skills. It is a program for anyone who uses coaching skills in their work and wants to learn the basics, deepen their coaching skills, or get a refresher on coaching skills. The Coaching Clinic™ is typically a two-day workshop, including core, advanced, and real-world coaching skills. There are also available add-on options including reinforcement sessions, group coaching, an executive overview session, and practice coaching opportunities. If you are interested in further resources for you or your leaders, we have a selection of blogs, case studies, and other materials available. Download an Overview of The Coaching Clinic™: Download a 2-page overview of The Coaching Clinic™–an interactive session geared toward anyone who provides coaching to others including executives, managers, and HR professionals. Coach to the Max White paper: Why does coaching work sometimes, but other times, not so much? This white paper dives into coaching—the why, the what, and the how—to help demystify and decipher the best coaching options to develop your leaders. 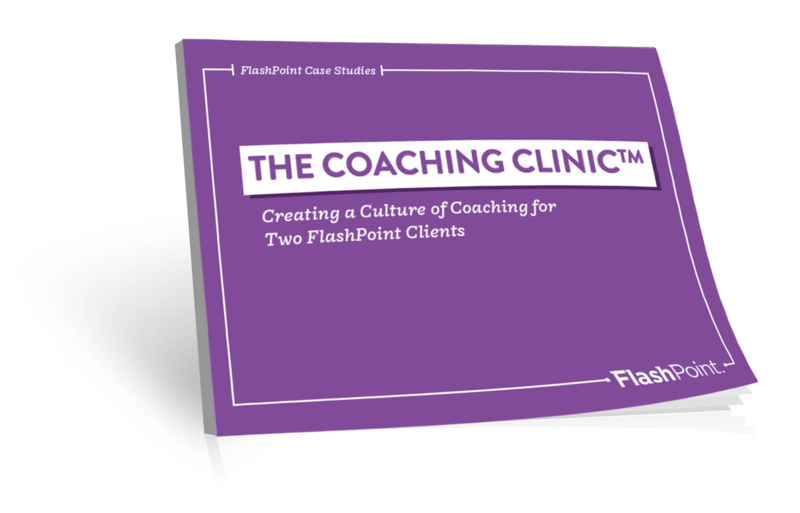 Coaching to Outperform the Norm Case Study: Read about how FlashPoint worked with a client to design and implement a culture of coaching. In this download, you'll be able to read about the client's challenge, participants, results, and the solution we implemented. Coaching Tips for Leaders: Maximizing leadership potential on your team starts with coaching. These five tips can help managers and HR and L&D professionals to develop leadership capabilities on their teams through coaching. Coaching Powers People to Become Leaders: Effective coaching develops ordinary people into people of power—people who become leaders. Coach Your Employees Like a Geocacher: A five-step guide to finding the hidden treasures of potential in your direct reports and employees by incorporating coaching into your relationships. Change Your Most Undesirable Habit…Now! : A change process led by a skilled coach can dramatically affect one’s life and work. This five-point guide demonstrates how a coach and an executive work together to bring awareness and change to a limiting behavior. Solving the Problem of High-Potential, Relationship-Challenged Executives: The higher a manager rises, the more important relationship skills become. Executives who are unable to influence and engage others may benefit from these three tips. A 3-Step Guide to Grit: Grit is the vision to see beyond what is—or what could incrementally be—to a much bigger outcome. Leadership requires grit; learn how to build grit with three steps. A Guide to Making Deliberate Practice a Daily Habit—from Kouzes, Posner, and Dad: Deliberate practice is described as the intentional, sustained practice or rehearsal of skills in order to develop a higher level of competence and performance. You can practice self-coaching to become a better leader with deliberate practice. Trends and Benefits of Coaching in the Workplace [Infographic]: Providing coaching support to leaders helps them execute strategy, manage through dynamic change, and engage their employees. These 4 statistics can help you gain buy-in for coaching. A Case for Coaching Integration: Coaching is best when integrated into leadership development programs to create vertical development: bigger minds, a more cognitive approach to addressing challenges, and an ability to address complexity in the workplace in a way horizontal development can hardly touch. How Coaching Develops Leaders: 3 Benefits: New pathways, new habits, and new behaviors take time and continued effort. Finding a trusted coach to work with over time increases the likelihood that leadership development will really work and be sustained, with lasting impact on business success. I’ve Implemented Coaching, But Now What? : The impact of coaching can be measured using 5 levels: reaction, learning, implementation, business impact, and return on investment (ROI). Coaching as a Tool to Develop Leaders: Learning is an iterative process that takes intention, focus, and (optimally) a good coach who asks powerful questions positioned at the right moment. Group Coaching: 8 Benefits for Your Organization: Group coaching can serve many different needs and have a variety of benefits for organizations, whether your team needs to be better connected or more accountable. How to Deal with Emotional Reactions to Feedback: Coaches can support a leader and defuse a difficult feedback session by understanding why people fear and react to feedback. You are not only dealing with what is current in the leader’s world, but his or her history, how he or she is “wired,” and his or her beliefs about what feedback means. Ask Questions Like a Coach to Increase Employee Engagement: Organizations know the impact of coaching can be intensified by developing leaders to adopt coaching skills in their role and creating a culture of coaching to experience the same benefits. 4 Ways Coaching Grows Leaders: The best approach to developing leaders is the one that maximizes their potential as well as their possible impact on the organization. Organizations benefit from the sharpened focus and expanded thought process that individual leaders develop by working closely with a coach, while individual leaders benefit from the exponential growth and targeted development opportunities. Conversational Intelligence for Coaches and Leaders: Conversational intelligence is “the hardwired ability in all humans to connect, engage, and navigate with others.” In other words, it is “we-centric” leadership–exactly the kind coaches and manager-coaches strive for. 7 Tips for Managers to Become a Better Coach: Every manager has opportunities to incorporate coaching skills into their relationships with employees, even in fields where processes and structures make it challenging. 8 Essential Ingredients for Adopting a Coaching Mindset Today: With clear direction and guidance from a coach, the coachee will be able to solve his or her own problems and broaden his or her thought processes. Adopting a coaching mindset will facilitate the coachee's learning and reflection. 3 Coaching Scenarios in the Workplace Right Now: Manager-coaches should take advantage of these three opportunities for coaching conversations: a career goals conversation, a performance opportunity, and a performance evaluation.